Choosing the new show to blog for Saturdays was tough. It’s too good of a slate to take nothing from it. But I’ll still be blogging Space Brothers once the new-timeslot recaps finish up, and I don’t even want to think about what a 3-show weekend would do to the progress of stats and miscellaneous articles I’m writing up. So I’m left with a choice between Attack on Titan and Muromi-san. Titan has the plot and presumably some upcoming great action scenes, while Muromi-san has the higher energy level and small-things cleverness. While both are probably within my favorite 5 of the season at this point, I ultimately settled on Muromi-san because I simply liked it better from what I’ve seen so far. Half-episode comedies hold a special place in my heart for a number of reasons (mostly that I never get tired of sticking up for Astro Fighter Sunred). In some ways, I think they’re more adapted to the sort of random gags Muromi-san has been rolling with. 24 minutes is enough time for one to start getting bored, but cut that time in half and suddenly it’s a lot easier to spend the whole episode working one or two lines of jokes without getting old. Reminds me of Teekyu, a show that didn’t need more than 2 minutes per week to tell a story. Heck, with that show, 5 minutes per episode would have felt like a stretch. Muromi-san excels at a bit more than just the meta of comedy. Both the breathtaking sunsets and the splashing sea-foam bits where budget was actually spent gave off a very authentic impression of characters having fun on the beach. Atmosphere’s not as important in a comedic series, sure, but a director putting in tlc into depth where he doesn’t have to tells me I’m looking at a show that really cares about being fun. 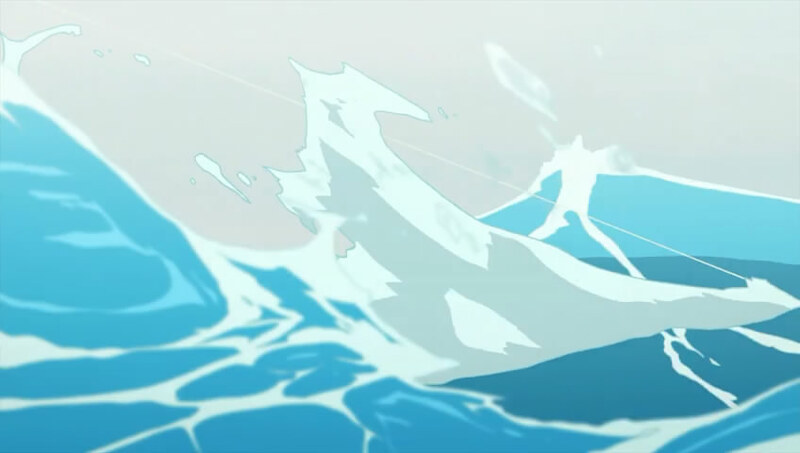 On a more basic level, scenes like the aforementioned waves and guitar riffs one are just pleasant to look at. Takuya and Muromi did a very solid job of holding their own last week with classic manzai style and the help of a few invertabrae extras. Introducing the rest of the cast adds a lot to the proverbial repertoire; I think they’ll get serious mileage out of Levia, as those cutaways of her guzzling beer while watching ancient Troy be destroyed were pure gold. Muromi and Takuya, meanwhile, were as fun to watch as last week, mixing energetic cuteness with utter deadpan. It’s theoretically that possible the decision to blog this show will turn around and bite me in the behind later. Based on everything I’ve seen so far, the director has his head screwed on as straight as a comedy where mermaids singing caused the kamikaze will allow, and that trait is one I’ve seen yield rock steady results time and time again. 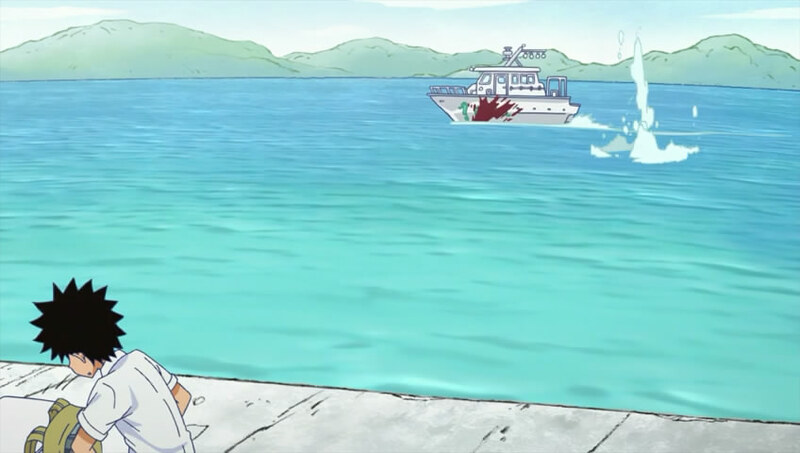 This entry was posted in Anime, Finished and tagged >20 minutes of runtime, Anime, Another, Astro Fighter Sunred, Attack on Titan, Deadly Boats, Deadpan like a corpse, First Reactions, It's all about the little things, Mermaids, Muromi-san, Puns Akimbo, Spring 2013, Spring 2013 Anime, Teekyu, The apocalypse: Now with beer! by torisunanohokori. Bookmark the permalink.